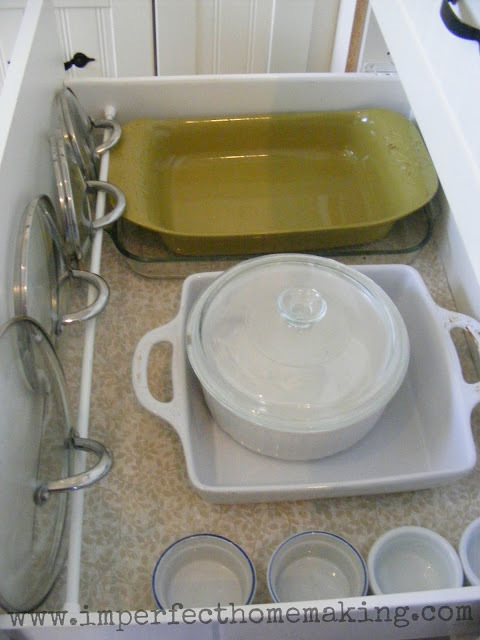 I always love the clever uses for tension rods that I find online and some of my favorite are in the kitchen. They are great for organizing cookie sheets and cutting boards in your pantry and one of the best ways to store cleaning supplies under your sink. And now, they are my favorite way to keep pot lids in place. They take up less space in your drawer and you don't have to worry about the handles causing your drawer to get stuck. You can check out this kitchen organization idea, as well as the rest of Kelly's beautifully organized kitchen, over at The Complete Guide to Imperfect Homemaking.